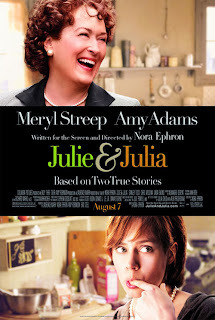 Doubt co-stars Meryl Streep and Amy Adams semi-reunite in the delicious new film, Julie & Julia. It chronicles the story of aspiring writer Julie Powell, discontented with her life and job as she approaches her 30th birthday. She decides to take on Mrs. Child's recipes for a whole year, and blog about it. (It later became a book.) The movie is also based on Mrs. Child's memoir, My Life in France. It's great to see a story with a strong woman imparting some of her strength to a young, unconfident female to affect changes in the latter's life. But the biggest attraction was the food. I wanted to sample all the food made onscreen. It made me think of wonderful movies like Eat Drink Man Woman, Like Water for Chocolate, Tampopo, Chocolat. Now if only my joy of eating could turn into a joy of cooking. It was a delightful movie! But maybe we need to put a warning on the review....don't go to this movie on an empty stomach bec you'll just suffer LOL!